Ayr and Stirling County compete for the Cairdeas Quaich at Millbrae on Saturday, kicking off at 3pm in the BT Premiership. The additional silverware marks the friendship between the two clubs but the teams will be putting that to one side until the final whistle as they battle for points in the league. County are currently second and will be looking to maintain that spot, whilst on the back of an encouraging win against Currie Chieftains last weekend, Ayr are focused on moving up the leader board. "Last week was a much improved performance," says Ayr head coach Calum Forrester. "The challenge for us is to put in a performance for the full 80 minutes this weekend against a Stirling side that is full of confidence having started the season strongly." Three former Ayr players return to Millbrae in County colours, with Ross Curle, Kerr Gossman and Peter Jericevich starting against their old team-mates. In the Ayr squad, the starting line-up is unchanged from last week. Tommy Spinks is named on the bench after shaking off an injury, and Robbie Nairn could make his debut after joining the club in the summer. Grant Anderson; 14. Scott Lyle, 13. Danny McCluskey, 12. Stafford McDowall, 11. Craig Gossman; 10. Frazier Climo, 9. Harry Warr; 1. George Hunter, 2. Robbie Smith, 3. Steven Longwell; 4. Robert McAlpine, 5. Scott Sutherland; 6. Blair Macpherson, 7. George Stokes, 8. Pete McCallum (c). Lewis Anderson, 17. Adam Prentice, 18. Tommy Spinks, 19. Paddy Dewhirst, 20. Robbie Nairn. The 2nd XV also play host to Stirling County in BT National Reserve 1. 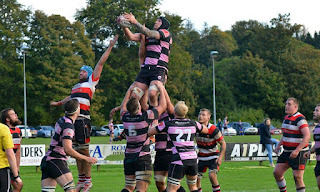 After drawing with Currie Chieftains A last week, Ayr look to return to their try-scoring form. Once again, there is a good balance of young talent and experience in the squad, with Stuart Fenwick making a possible comeback off the bench. Johnny McCorkindale; 14. Jamie Bova, 13. Matt Davidson, 12. Sam Graham, 11. Cameron Taylor; 10. James Pinkerton, 9. Lewis Young; 1. Ruairidh Sayce, 2. Stuart Collier, 3. Fraser Miller; 4. Seth Rae, 5. Adam Paxton; 6. Craig Brown, 7. Gregor Henry, 8. Cameron Reece. Stuart Fenwick, 17. Alistair Hutton, 18. Logan Richardson, 19. James Armstrong, 20. Sam Gray. Kick-off 3pm. Follow the scores via the Ultimate Rugby App.